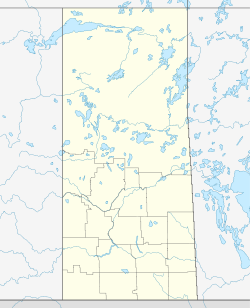 Watrous /ˈwɑːtrəs/ is a small town in Saskatchewan, Canada. It is 106.9 km east of Saskatoon and has an economy is based on agriculture and tourism because of its proximity to Manitou Beach, home of the Mineral Spa and Danceland dance hall (known as the "Home of the World Famous Dance Floor Built on Horsehair"). Watrous was named after Frank Watrous Morse. The town has many restaurants, a hospital, medical clinic, two schools, community college, bowling alley, RCMP detachment, banks, grocery stores, co-operatives, tea store and motels. 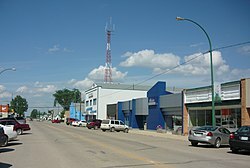 Watrous is also notable for being the location of the transmitter of CBK, CBC Radio One's primary station in Saskatchewan. The transmitter was originally located at Watrous in 1939 in order to cover most of the Prairie Provinces with a strong nighttime signal (the station, then as now, is a 50,000-watt clear-channel station). 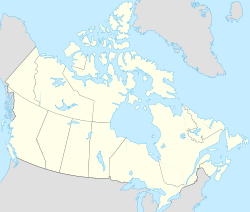 It was also intended to serve most of the province's populated area, including Regina and Saskatoon, from one transmitter. While Watrous is the station's city of licence, its actual studios are located in Regina. The Watrous transmitter is still considered the station's primary signal, even though both of the larger urban areas are now served by separate FM rebroadcasters. The Jubilee Drive-In theatre is open from the Victoria Day weekend until October. The All Saints Anglican church on Main Street has a stained glass window that could be over 500 years old. The window may have come from St John the Baptist Anglican Church, Latton, Wiltshire, England. ^ National Archives, Archivia Net. "Post Offices and Postmasters". Retrieved 6 September 2009. ^ Government of Saskatchewan, MRD Home. "Municipal Directory System". Retrieved 2014-03-11. ^ "2011 Community Profiles". 2011 Canadian Census. Statistics Canada. July 5, 2013. Retrieved 2013-01-07. ^ "2006 Community Profiles". 2006 Canadian Census. Statistics Canada. March 30, 2011. Retrieved 2013-01-07. ^ "Stain Glass Institute of Canada". Retrieved 2012-12-20. 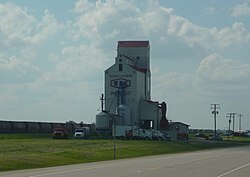 Wikimedia Commons has media related to Watrous, Saskatchewan.